Usually love your comments, in this case feel there is a confusion of categories here. It is my understanding that the ecclesiology of traditional Anglicans (of which the Episcopal church used to be a member) is not seriously different from that of the RCC, whatever your views may be about the validity of our holy orders. On the other hand, the current regime in the Episcopal Church has a radically different view about that, as about many other things, in addition to having a penchant for using language rather loosely. Following Foucault and his ilk slavishly in this respect, one suspects. One can't always be certain exactly what they are saying, except that whatever it is, it's not orthodox! 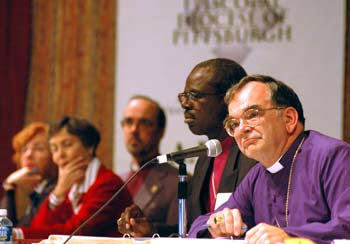 Many Anglicans consider that the ECUSA and similar bodies (e.g., the ACoC) have left the Anglican Communion, and that entities like the Diocese of Pittsburgh are taking steps to ensure that they remain within it. The traditionalist remnant are left pondering how best to care for one another as Christians, even if from the view of your church we are (...here I forget the term, which defines degrees of consonance with the notion of full communion) not quite "with it." I agree with you, but I would argue that the position of the leadership of the Episcopal Church (Katharine Jefferts Schori) does not represent traditional Anglican ecclesiology, just as those in our own hierarchy who push for the ordination of women do not share traditional Catholic ecclesiology. "[A] bishop who attempts to secede from the church at large automatically loses his powers, just like an employee who quits a job loses the authority from the company that came with that job." Ms. Schori's own argument would therefore excommunicate and reduce to nothing Archbishop Cranmer of Canterbury and his Anglican Church.